New technologies for superior fish feed characteristics? Technological advances, which focus on both cost savings in the form of reduced down time as well as optimal flexibility in terms of capacity and quality, have been in demand by the industry. * Recovery of essential amino acids and specific vitamins. On the most technologically updated extruders an optimum screw configuration can be established in order to apply the SME quantity necessary for matching a specific product, e.g. salmon or trout feed with a high content of fat/oil, internal oil or similar products with high nutritional value. The task of producing fish feed primarily consists of combining an optimal product quality (optimum cook) with minimal production costs. Changes in screw configuration and other measures, which may contribute with higher or lower SME values, are all operations, which usually result in down time and increased production costs. Changeover procedures between ½-2 hours to adapt an extruder to a specific product are not unusual. Fig. 1 shows the difference in SME typically generated in a high shear extruder configuration, compared with the SME range used when operating the FLEXTEX system (high protein floating fish feed). • No need for changing extruder configuration regardless of SME requirement. • Consistent capacity of extruder. • Reduced number of adjustment parameters during the extrusion process. • Basically only the SME is changed (set-point). • Less impact by die plate design. The FLEXTEX system is based on being able to continuously control the SME applied in the extruder during operation without changing the extruder configuration or other parameters. The system adjusts the opening area in the venturi die plate, which is placed between the last screw and the die plate in the extruder. 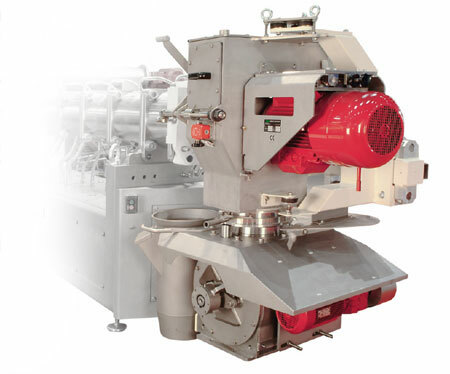 The venturi die is used in many extruders in a stationary design to decrease or increase the kneading zone in the extruder in order to control the SME applied. This is done by adjusting the size of the hole and thus the opening area and the pressure against it. The smaller the hole, the larger the pressure and thus the more energy consumption from the main motor (see fig. 2 and 3). 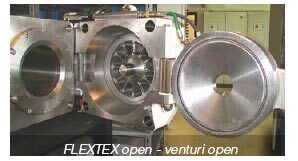 With the FLEXTEX system the opening area of the venturi die can typically be adjusted from 3000 mm2 to 100 mm2 (4.65 to 0.15 in2) depending on throughput (see fig. 4). With the FLEXTEX system the extruder operator can determine how much specific mechanical energy (SME) the product needs. From a control system, for example a separate control or alternatively a control integrated in the extruder control, the operator can make a set-point, e.g. kW/ton (HP/ton) dry matter. 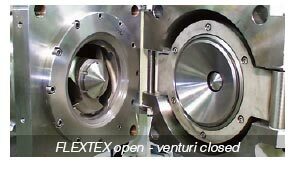 By means of a hydraulically controlled piston the FLEXTEX system automatically adjusts in relation to the set-point by decreasing or increasing restriction of the venturi die by moving a piston. • The starch cook (up to 100%) is completely controlled during operation. • The bulk density of the product can be reduced by up to 30% and can be controlled with an accuracy of ±5 g/l (0.3 lbs/ft3). • Higher addition of oil and less starch in the formula without significant influence to bulk density and product quality. 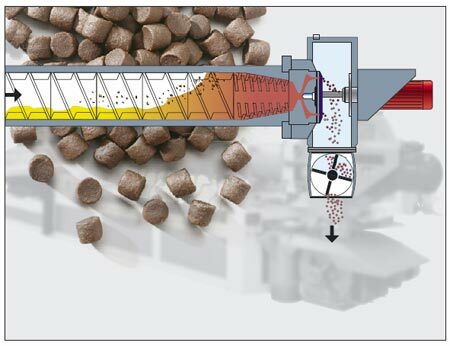 The task of extruding fish feed is primarily a matter of cooking the starch, but in addition also to control the product density and thus the sinking or floating properties. 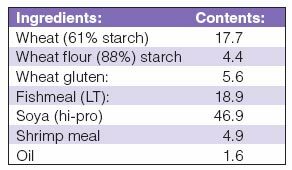 Typically the degree of starch cook varies according to the amount of carbohydrates in the formula, where 80% or higher is typical on trout feed but only approx. 70% on e.g. shrimp feed. By making a specific screw configuration of the extruder one can to a certain extent supply the specific mechanical energy (SME) necessary to produce a given product with an optimum degree of cook. The degree of cook is decisive from both a nutritional as well as a physical product quality point of view. The better starch cook, the better quality! In order to improve profitability of fish feed, formula cost must be reduced to a minimum. 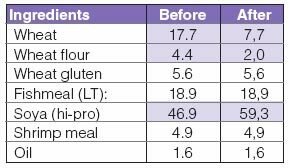 By improving starch cook the level of carbohydrates can be reduced, thus including additional cheaper protein sources, which all contributes to lower costs. The FLEXTEX system is designed with focus on simplicity and consists of a few components only. The critical part of the system is however the piston, which - besides being used as a restriction for the meal fl ow - also distributes the meal to the die plate. When restricting the meal flow it is essential that this takes place synchronically in order not to hinder the flow ability. Changes in the meal flow will influence the visual quality of the product due to an uneven pressure at the die plate. The piston in the FLEXTEX system is moved axially and at the same time it is conical, so that the meal flow is not negatively influenced. 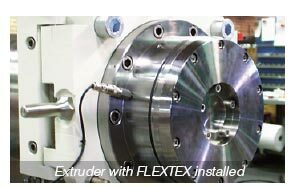 using the FLEXTEX system an increase in bulk density is controlled in the same way as in all conventional extruders. All parameters, which have a positive infl uence on increased bulk density, have a negative influence on starch cook, as increasing the bulk density in principle is a matter of reducing the SME and thus the starch cook. To be able to control the bulk density of products in a wide range and at the same time obtain an optimum product quality, the Density Control System (ECS) is unique. The ECS concept (patented) is based on controlling the expansion in the extruder knife house without influencing the product quality. Thus all desirable parameters can be used in the extruder without regard to expansion. Main focus is product quality! By adding compressed air in the knife house one can control and adjust the pressure. This is made possible by mounting an airlock under the knife house (see fi g 5). An increased pressure in the knife house results in a reduction of flash-off and thus an increase of bulk density (less expansion). The larger the overpressure, the larger the density (less expansion). The FLEXTEX and the ECS systems can either be installed individually or as a combined concept. This is solely a question of each producer’s requirements in the production. 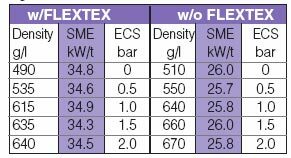 Most frequently a FLEXTEX system is installed as a result of a requirement for either more starch cook, reduced formulation costs, or increased capacity. By increasing the SME in the extrusion process by approx. 12% the cook rate was increased by 11.8%. The ECS can increase the bulk density by 25% by adjusting the pressure in the knife house only! By increasing the SME it was possible to increase the water stability by additionally 6 hours. By reducing the starch contents by approx. 50%, equal water stability (8 hours) could be obtained as with original high starch formula, but without FLEXTEX (8 hours). The FLEXTEX and ECS system provides significant flexibility in the production of feed for all fish species. By continuously controlling the SME during operation it is possible to achieve an optimal physical quality. At the same using the ECS to control the density two unique tools for controlling finish product characteristics are present. • Increase starch cook by 10-15%. • Decrease bulk density by 20-30%. • Increase bulk density by 0-5%. • No change of screw configuration (reduced down time). • Only two parameters needed for controlling starch cook, reduced and increased bulk density.